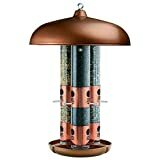 Yes, it's a great feeder-it provides a variety of feeds for a variety of birds. We have had an older non-copper (looking) model for two years in two homes and ,up until now, it was industrictible. Yes, we had to position it to keep off the squirrels but the feeder kept a lot of birds (and us) happy. Unfortunately, a group of raccoons recently discovered the feeder and my anti-squirrel measures have not worked. The worst part is that the heavy weight of a raccoon landing on the tray has caused it to break, spilling the entire contents of the feeder on the ground. They too were very happy. The bottom tray and the tabs that attach it to the tubes are plastic, like the rest of the feeder, and will break, given enough force. 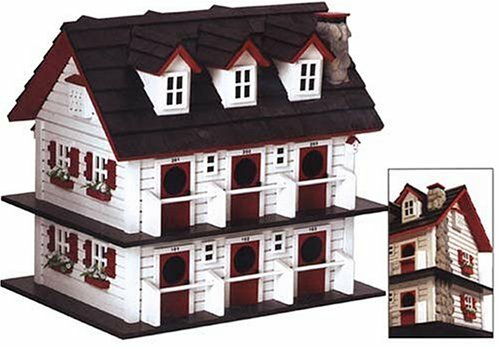 If you don't have any raccoons, this is still one of the best feeders that I have seen. In fact, I will order another one because I've since discovered a better way to keep the critters off. Great House warming gift ! This gift was a perfect house warming gift for a friend. Something they could admire outside there new family room window. 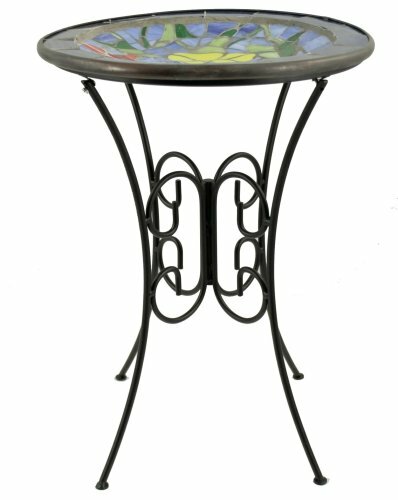 It's attractive and functional and does not impose on the decor of a new home. 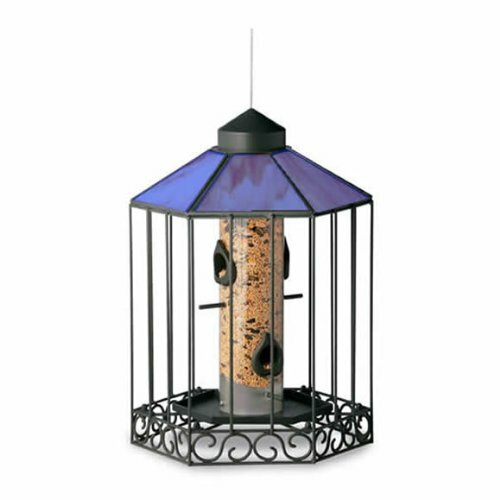 This is an attractive-looking, well-designed bird feeder; a best buy. 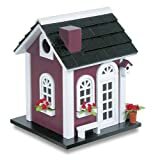 Warning: It loads up with a massive amount of seed--a positive--but it'll crash heavily and destructively to the ground unless you secure it well (not fault of feeder--due to my stupidity). I'm buying an exact replacement feeder now, wouldn't consider any other brand. I read the other reviews for this product so I was made aware of the fact that this feeder is made of plastic & not copper. I wasn't concerned because the feeder is absolutely gorgeous anyway! 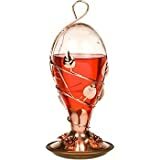 I had recently purchased other copper feeders & houses & this one fit right in with my decor. It is indestructible but squirrles do get thier share of food from it because the bottom is large enough for them to sit in. I don't mind because I adore squirrels & the birds get plenty of time on it also. I recommend this for anyone who likes the look of copper & if you don't want squirrles to use it be sure & hang it from a place where they can't get to it. The extra large top of this feeder does pose some problems for them but they are persistant & can figure out ways around it. This feeder is GREAT! Not only does it have a great price for it's high quality but it took me all of ten minutes to remove it from its' box, assemble, mix and fill with nectar and mount on my window! When ordering, I was a bit cautious about the suctions holding up the weight of a fluid filled glass jar but it's given me no troubles what-so-ever (like I said...high quality). Hummingbirds came within two days...got to love it. I just purchased this feeder. I have a big back window the perfect place to hang it. The feeeder holds alot of food and was very easy to fill and hang. It is made of glass instead of the other cheap plastic ones and is very attractive too. I ordered my feeder in july and really thought i wouldn't get any hummingbirds because I thought i was too late to have an established feeding area, but i was wrong ,,I hung the feeder on the windown and within an hour I had my first hummingbird feeding out of it , I have 2 birds that now come to my feeder on a regular basis, they are beautiful. Maybe third time is a charm??? I'm about to buy my second replacement, after the glass cracked on the first two. Quality is very low, but the ability to put this feeder right on our kitchen window is wonderful and our children adore it. If I could find any similar product from another manufacturer, I'd buy it instead. What a wonderful method to see hummers up close! The Hummingbirds at our place love these feeders. You can sit at your window and watch them fighting over them, or watch them feeding. They quickly get used to your presence. 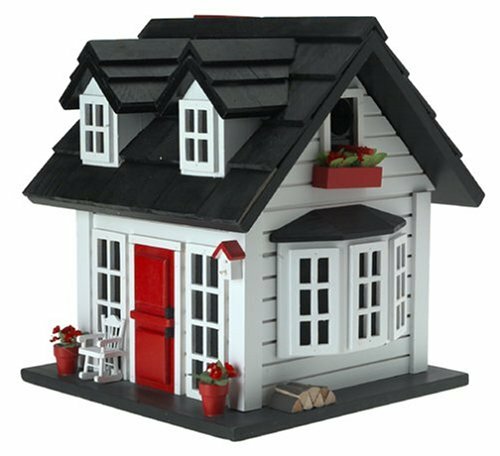 They also help to let the birds know there is a window there, so it serves two purposes. 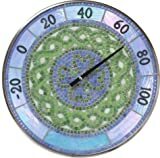 Thermometer is 15" in diameter and weighs 6 1/4 lbs. For some reason, the finches we have at our house refuse to use this feeder -- even though they flocked to a cheap $5 tube feeder I had before this one! The other cheaper feeder had a flat tray on the bottom, which they seem to prefer over this design. I left it hanging out there for weeks and not one bird used it, so I finally gave up. Company is VERY, VERY quick with delivery. It wasn't the finch feeder I wanted though...feeder discontinued that I had wanted. Waiting for credit to my charge card. 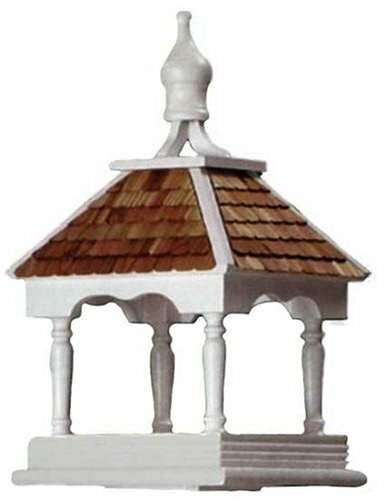 This is a very nice birdfeeder, howver I had already received a free one (similar) that was replaced through Opus's lifetime warranty. Very pleased to report..they do honor their guarantees..very quickly I might add. Will do the job fine. Just KNOW what you're buying! Honestly, I haven't seen this particular model, with the so-called "copper" that another reviewer found was only plastic. 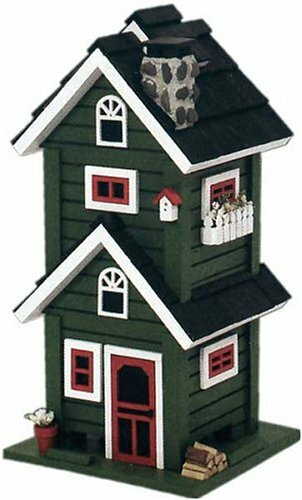 (I agree; the description is highly lacking...) However there's no reason this thistle feeder wouldn't work just fine, hanging in an appropriate location, and barring the aggressions of your local squirrel population or your dropping it regularly. I do think the buyer should know that THISTLE seed (a.k.a. Niger seed, pronounced "NIGH-jer") is very thin. 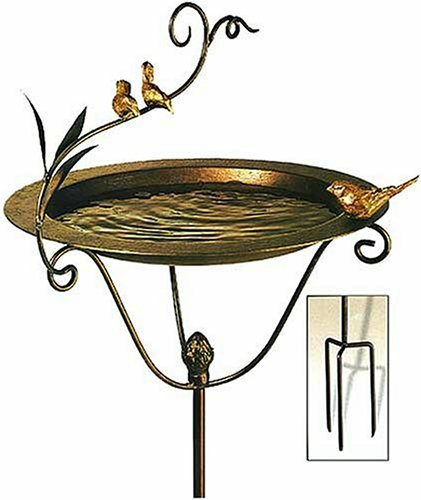 Therefore, this feeder will have very narrow feeder holes, unlike a "regular" bird feeder using sunflower or mixed seed, which will NOT work here. The thistle feeder's primary purpose is to attract goldfinches, who tend to shy away from the brouhaha at mixed feeders, and to exclude those birds who frequent the larger feeders. (The other birds will give up on this one in frustration and head to feeders with easier access, which you may decide to maintain as well. I would.) The finch's bill allows it to pick the tiny seeds out from the narrow openings. So please keep larger seed out of this feeder; the finches won't be able to get at it. You'll only be teasing them! Know that thistle seed is more costly than black oil sunflower or mixed seed, and that's what you're committed to using when you buy this type of seed-specific feeder. Please do a little reading before placing the feeder outside. Any book on backyard bird feeding will be helpful. You'll find it may take time for the goldfinches to find your thistle feeder, as is often the case with *any* new feeder. You'll learn which seasons are best for goldfinches to be in *your* geographic area. 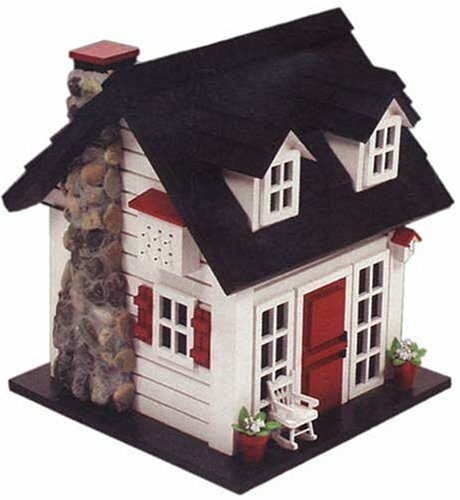 And you will then know what areas of your yard are best for placement of the feeder. Seriously consider keeping some sort of water nearby as well. If not a birdbath proper, a large, shallow dish with water and a few large stones in it will do nicely. Just remember to change the water every couple of days. I have had one of these for four years, and it's a nice feeder, except, as others have noted here, the plastic part you hang it with is just glued on, and it fell off not long after I got the feeder. Luckily the feeder was hanging over soft mulch in the veggie garden and not the rocks by the foundation of the house, so the glass globe did not break. I re-attached the hanger with Plumber's Goop (ranked next to duct tape in importance as a "Handyman's Secret Weapon") and it held OK. The problem seems to be that whatever Opus is using for an adhesive simply does not bond plastic to glass very well. Also, the little hole for inserting the s-hook is pretty small -- I ended up using thin wire instead. Yet another problem is that the glass globe is difficult to clean inside by hand (we don't have a dishwasher) because the hole is too small to admit the average bottle brush. 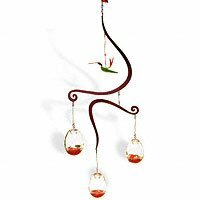 Because of all this futzing around, I'm only giving it three stars, even though the hummingbirds love it and it look pretty when the sun shines through the glass. I purchased this model last summer. The plastic hook broke off very soon after it was hung. It appears to have been simply glued onto the top of the feeder. I have made several unsuccessful attempts to to reattach the hook. The feeder is now useless. 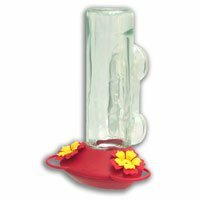 I have enjoyed using this Hummingbird Feeder but find it difficult to keep cleaned. 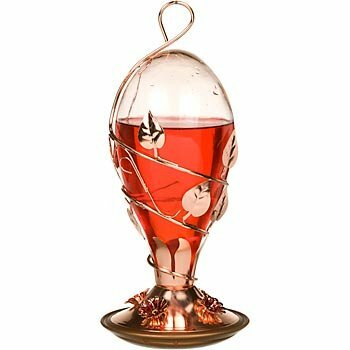 But the size if perfect for hummingbirds and works well in my yard. Maybe it's just me, but as soon as I went to pinch the s-hook hanger provided with the feeder together, the glass eye the feeder is supposed to hang by broke. It would have been better to provide some sort of ring already in through the hole so pinching the s-hook together wouldn't cause the feeder to break. Well, now it's hanging by a makeshift cord "holder" I created. 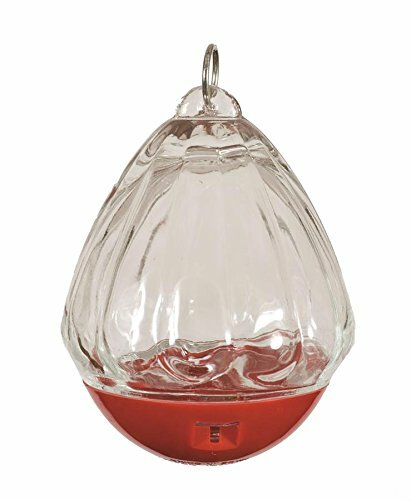 I gave the product 3 stars because it is easy to fill, easy to clean, and the hummingbirds in my yard had no problems switching from my UV weakened bottle-feeder to this feeder. I deducted one star because my birds seem to like a perch and this feeder doesn't have one, and one star for not providing a hanger already in the glass eye that the feeder hangs from. Hey guys, guess what! Glass is fragile, I'm an idiot, make it idiot-proof! 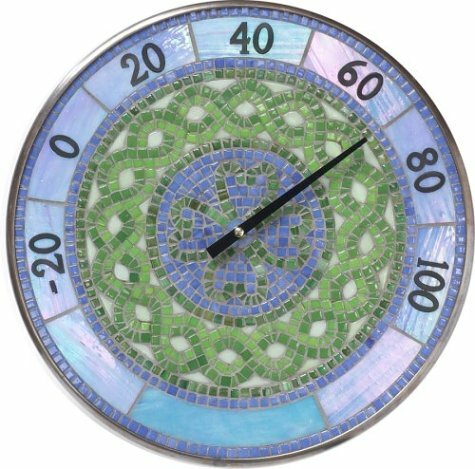 Great gift idea - also perfect as an indoor decoration piece.